We begin our visit to this church not in Rome but in England, in one of the dungeon chambers of the Tower of London. There, in 1535, sat the bishop of Rochester, imprisoned for his refusal to sign the oath which would affirm Henry VIII as the supreme head on earth of the church in England. Pope Clement VII, hoping to save the faithful bishop, elevated him to the honor of cardinal and assigned him this church as his title. Upon hearing of this, the king declared that, rather than send the red hat to England as was the custom at the time, he would send the bishop’s head to Rome. And so did St. John Fisher bear witness with his life to the truth, as did the saints here commemorated. The patron of this church, St. Vitalis, himself bore heroic witness with his life during the Roman persecutions. There are several histories about his martyrdom, which seem to place the date of his suffering in the early second century. He seems to have been of some social standing, and would encourage those about to die for the faith. As a result, he himself was tortured on the rack and then killed in the area of Ravenna. Traditionally he is believed to be the husband of St. Valeria and the father of Ss. Gervasius and Protasius, all of whom were also martyred. This was originally the site of a small oratory built in the fourth century, dedicated to the martyrs Ss. Gervasius and Protasius. At the end of that century a rich widow named Vestina left all her money to the shrine, enabling the construction of a much larger church with the same name. This was dedicated by Pope Innocent I in the early fifth century. 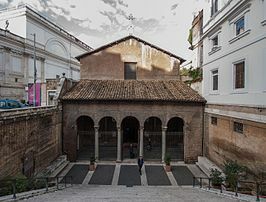 He also created here the Titulus Vestinae in honor of the donor; this is last- built church to be include in the list of the original tituli of Rome. Originally, the front of the church was open to the street, as was also the case in Ss. John & Paul and St. Peter in Chains. However, soon after its dedication these arches were closed. In the seventh century this church first began to be referred to as St. Vitalis, also being included in the stational list around the same time. The church was renovated in the twelfth century, and again in the late fourteenth century. It is interesting to note that, while the church is recorded as being in ruins before this latter renovation, it is still listed as having clergy assigned to it, leading us to wonder at the conditions in which they served here. Pope Sixtus IV closed off the aisles in 1475, reducing the church to a single nave. The current decoration was completed from the late sixteenth century through the eighteenth century, in the styles of those periods. In 1859 Bl. Pius IX oversaw a restoration of the church, followed by another one almost a century later in which the original porch was revealed. The church is entered by descending a LONG flight of steps (which you can see if the first photo), made necessary by the raising of the street level in the late 19th century. The restored porch is supported by columns made for this church, an exception from the practice of the time in which it was more common for parts of older buildings to be recycled in new construction. The 5 original archways can be seen at the back of the porch. Your eyes are moved toward the high altar - where there are images depicting martyrdoms. On one side, St. Vitalis being tortured on the rack, and on the right his martyrdom by being burned alive. While this church may first seem as simply a gallery of suffering, it cannot be forgotten that this is not a suffering unto death, but unto the promised life without end - be it the suffering of St. Vitalis or St. John Fisher.